The below Schematic Map Drawing gives a clear overview of Lanzhou City Prefecture in Gansu Province. 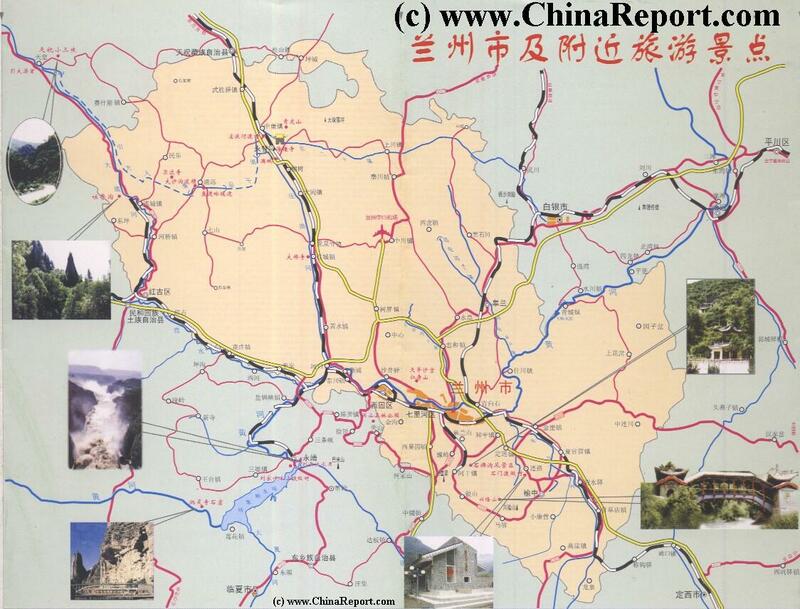 The Map Lanzhou Prefecture and relevant parts of adjacent City Prefectures as well as neighboring Qinghai Province. Clearly visible are the Five Urban Districts of the Central City of Lanzhou; Chengguan District (城关区), Qilihe District (七里河区), Xigu District (西固区), Anning District (安宁区) and Honggu District (红古区) or the Economic Development Zone. Spaced around the Five Urban Districts, -the city proper-, lie the outlying districts, designated as Counties. The First and most remote of these of Yongdeng County (永登县), which extends to the North-West upon the Loess Plateaux and includes Tianzhu Tibetan Autonomous Township (天祝藏族自治县), sections of the Han Dynasty (206 BC - 221 AD) Great Wall of China, plus some rare eroded clay landscapes some of which contain fossils. Going around the Map in Clockwise order is Honggu District (红古区) . Honggu District is the second outlying district located upon the arid and dusty loess plateux with its many Cliffs. Apart from the Zhongcuan National Airport that serves Lanzhou, the district is also home to the Minhe Autonomous Township of the Hui Minority. Third in the list is Gaolan County (皋兰县), which is the district which lies due North of the City and the Yellow River Gorge, covering the region between the original City of Lanzhou, Chengguang District, and the City of Baiyin. The town of Gaolan sits about halfway between both cities. - Please use this Map to Navigate Lanzhou & immediate vicinity. Last and nearest the Urban sprawl of Lanzhou is Yuzhong County (榆中县) which has its administrative seat at Yuzhong to the South-West of the Chengguan (old City) District of Lanzhou. Yuzhong covers the important pass leading south-west and down through Dingxi and Tianshui into Shaanxi Province, aslo known as the Mother River Route. - Compare Maps and learn to Navigate easily to Landmarks in Lanzhou City and immediate vicinity.